This past year I have been engaged in an experiment. I have re-entered the world of classical music after having spent several years of my own meditations as well as taking part in an intensive personal development group. One of the primary things I learned in this period of time is that WE are the authors of our own reality. Every day, every hour, every minute and second … we author the world around us based on the programming we have received over the course of our lives. What we’ve been taught from birth. Traumatic experiences that have shaped us. The families we were born into … etc. etc. These are the filters for how we view the world … and thus how we create our personal reality. But you don’t HAVE to let this be your reality. You can learn how to go within and bring resolution and peace to those inner conflicts and burdens that so shape your current existence. You can be your own author of whatever story you choose. So, I re-entered the world of music with a very specific promise. I was going to take whatever opportunities presented themselves to me, and do my absolute best with each one. No worrying about the future or fear of rejection to sabotage me … just staying in the present and doing my best with what unfolds. In order to do this I basically had to let go of results. I let go of worrying about success or what others would think of me so that I could simply focus on keeping my heart open and doing the best that I know how to do. As long as I do those two things … I am a success! The results have been fairly mind-blowing. By the time a year is up (still several months away) from having made this promise I will have performed roles in seven operas … that’s more than I’ve ever done in one year. Even still, there is fear and anxiety … what happens after this year? What if nothing else comes along and I’m right back to ground zero? What if opera is not the world for me as I once feared and wondered? What if, what if?? Sometimes I get lost in those “what ifs” … but all that developmental and meditative work I have done has shown me that all I have to do is stop, open my heart back up again and continue doing the best I know how. Whatever the result of all that is … doesn’t matter. Happiness and contentment are a result of living life in such a manner, as opposed to the outcomes I achieve. My results don’t define me, the manner in which I choose to author my life does … and I choose to be an open-hearted conduit of Love. Wherever that takes me, I am happy to go. Having faith is essentially keeping the door of possibility constantly ajar. 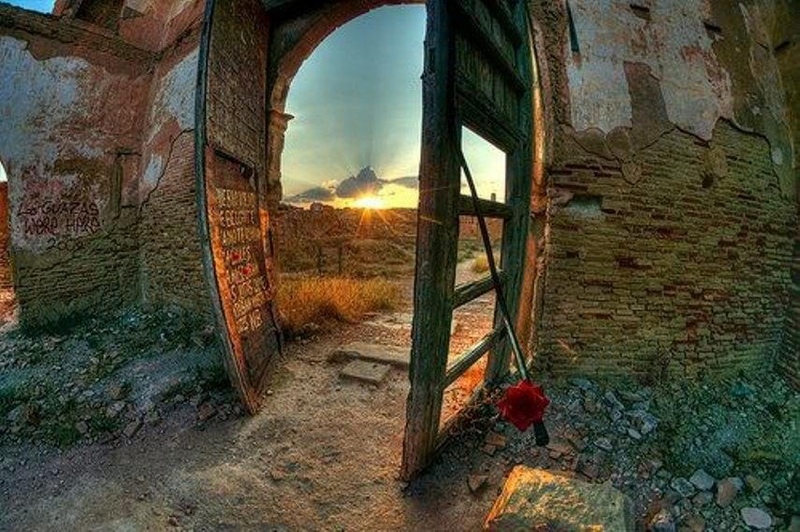 The proverbial door is really your heart; an ever-transposing portal to the Divine path intended for us. The world passes through US, and with our hearts blazingly open … we are able to discern and traverse the spiritual landscape of God’s intention. Blind but ever seeing. Deaf but ever straining to hear. Empty but always seeking to be filled by the only Essence that quenches this slaking thirst. This is a state that is very rarely rational. In fact, if one would try to make sense of it they would be maddened to the point of despondency, and convince themselves to give up. We do not have the minds to comprehend the brushstrokes of the Master. The incomprehensible milieu we perceive is but a tiny stroke on the canvas of what is intended. We strive to dictate our placement, shape, length of duration, and hue … without even knowing what we are a part of … it is thus that we pervert an intended masterpiece. All we can do is sit back in the seat of our consciousness … and wait … watch … breathe … discern … and then act when we are prompted. Everything along the way is simply to be enjoyed, or grieved, and then let go of … simply trusting that wherever we wind up is where we are meant to be.